Quickly whip up your own natural organic skin care recipes with common ingredients found right in your own kitchen! 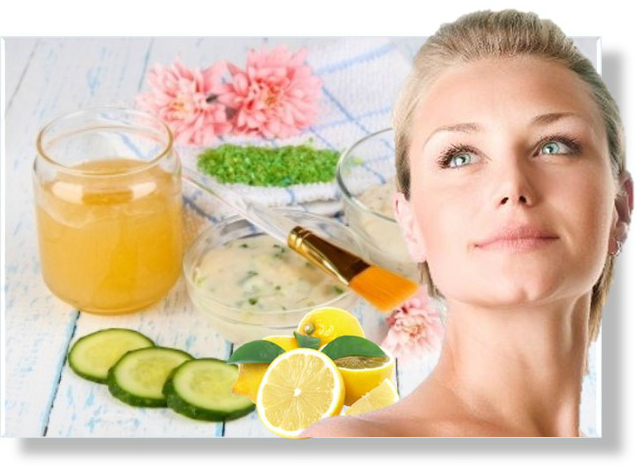 There is an extensive range of organic skin care ingredients that can be used in homemade skin care recipes to address a wide range of skin care issues, including the signs of aging. So go ahead. . . However, to keep things as easy a possible, the following listing represents only the more commonly used ingredients that are readily available in most kitchens. There really is no need to scour the health food stores in search of an obscure item when the most common natural organic skin care recipes ingredients can be found right in your own kitchen. Mix up a combination using the most common ingredients used in rejuvenating organic skincare products for potent anti-aging treatments. Aloe Vera is used for its soothing and healing properties as well as a moisturizer. Alpha Hydroxy Acids, AHA, are used as a chemical form of exfoliation. AHA's have a multitude of purposes, especially as an exfoliant. AHA's are found in milk products, many fruits including most citrus such as oranges or lemons, and, of course, sugar. A combination of these ingredients is typically found in natural skin care recipes for not only cleansers but for toning and exfoliating the skin. Aspirin is a form of salicylic acid and can be crushed, formed into a paste and used as a very effective exfoliating treatment. Avocado is considered to be an enriching moisturizer packed with a variety of vitamins and antioxidants. Buttermilk has been used for centuries as a natural cleanser,gentle exfoliant and skin softening agent. Citric Acid is a key ingredient in the alpha hydroxy family used as a powerful exfoliator. Other properties include the stimulation og collagen production to firm and tighten, lighten age spots and freckles, and unclog pores. Just squeeze a lemon, orange or lime can have profound results in just a short time. Cocoa Butter found in chocolate is a rich emollient and is used as a rich moisturizing treatment, yum! Coconut oil is an antioxidant and emollient rich in vitamins and minerals along with having a variety of medicinal properties that include healing as a natural anti-bacterial. Studies point to this ingredient as a natural anti-aging treatment to prevent the symptoms of premature skin wrinkling and aging. Cornmeal can be used as a gentle abrasive used as a natural cleanser as well in homemade microdermabrasion scrubs to unclog pores, and exfoliate dead skin cells that collect on the surface of the skin to brighten, soften and tone. Corn Starch is often used as an ingredient in masks for its absorbent properties as well as softening effects. Cucumber is rich in antioxidants, nutrients, phytochemicals and silica that works to fade dark under eye circles, reduce swelling of puffy eye bags, improve blood circulation , unclogs and tightens pores,and hydrate dry skin. It is also used a mild astringent to treat age spots. Eggs have several properties used in natural skin care. Egg whites can be mixed into a mask, and the yolks into an enriching moisturizing treatment to shrink pores and tighten skin while the yolks have potent emollient properties that will soften and hydrate the skin. Grapes are rich in resveratrol that reduces inflammation, slows the aging process, and is considered an excellent wrinkle treatment. They can be crushed and applied to fine lines and wrinkles for 10 to 20 minutes. Green Tea has a wealth of nutrients, has natural anti-inflammatory properties and is a powerful antioxidant which works to prevent and actually reverse sun damage. Moistened green tea bags can be used as an exfoliating scrub treatment as well as for a soothing under eye treatment. Milk and other similar dairy items are part of the alpha hydroxy family, lactic acid, that works as a gentle exfoliant to soften, improve skin texture, reduce scarring and increase hydration. Oatmeal is a soothing agent and is commonly recommended to relieve dry, itchy skin. It's one of the few natural ingredients approved by the FDA to treat topical skin irritation. Oatmeal can also be used as an exfoliant which also has a smoothing effect on the skin. Olive Oil, considered by some as an ancient beauty secret, is high in antioxidants including vitamin E. It has long been used as a rich moisturizing treatment to improve skin elasticity, heal dryness, hydrate and condition. Papaya Juice is a powerful antioxidant that reduces the signs of premature skin aging. It works as an extremely efficient exfoliant due to the papain protein dissolving enzyme, promotes cell renewal, treating acne prone skin, reducing age spots, diminishing pore size, helps prevent and treat blemishes and works as an effective natural cleansing agent. Pumpkin (along with other red, orange and yellow fruits and vegetables) is loaded with beta carotene. This nutrient stimulates cell turnover, has potent healing properties and works to protect the skin against sun damage. Rosemary has antibacterial and antiseptic properties which is excellent for oily and acne prone skin types. Salt is an excellent exfoliant, rich in minerals and nutrients working to treat acne prone skin, slow the aging process, and improve overall skin health. Soy, an emollient rich natural ingredient, can be used as a facial treatment in many of its forms; soybean, soy oil, miso and tofu to name a few. Soy lightens skin discoloration, reduces hyperpigmentation, softens and tones. Sugar is an AHA (a natural form of glycolic acid) and is frequently used in recipes for manual facial exfoliant scrubs. Vinegar, especially apple cider vinegar, can be used as a toner and a final cleansing agent as well as to rebalance the skin's acidity level. You won't even need your magic wand to achieve wonderful results with natural organic skin care treatments because there is really nothing magic about it . . .
As we know all natural skin care treatments have been around for centuries for very good reasons! 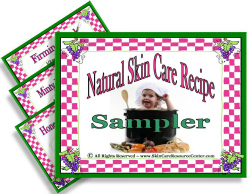 Did you download your free skin care recipe card sampler yet? The Recipe Sampler is FREE! For an extensive collection of all natural homemade organic skincare products that are specifically created to address a wide range of aging skin concerns the by all means, we invite you to get. 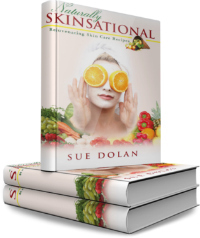 . .
For these natural anti-aging skin care recipes and over 150 others, order your copy of the Naturally Skinsational ~ Rejuvenating Skin Care recipe book. This exciting new natural organic skin care recipe book features an in depth look at a natural approach to making your own homemade organic skincare products and anti-aging treatments that are specifically formulated to focus on the rejuvenating properties and attributes of common herbs and substances.